carlsbad 5000 '09	The Italian Tuneup ..
An ‘Italian tuneup’ is when a mechanic takes an older car that is used mostly for stop and go traffic and drives the piss out of it. Basically you keep the car in a lower gear and drive at freeway speeds which redlines the motor and heats the oil up to very high temps. If everything holds together and the motor doesn’t blow up then the extreme heat cleans out accumulated deposits in the combustion chambers. The car then runs smooth and purrs like new until the deposit start to build up again. That’s the way I feel about a 5K race. Not that I’ve done many of them but they have a way of rev’ing your HR to the max, increasing the breathing rate to the hyperventilate stage and get those joints and muscles moving at warp speed. Just the perfect little tune-up with the Boston Freaking Marathon coming up in 2 weeks. 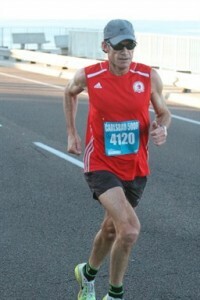 Actually I would have preferred to run a 10K but I really wanted to run the Carlsbad 5000 and the timing was right. I should note here that pure speed is really my weakness. When I was on the freshman basketball team I would always be the last one in any speed drill. But they say you should work on your weaknesses so I incorporated a bit of 5K type speed drills into my marathon trainings. O.k. not that many but I did get to the track twice to do 4×200’s, 4×400’s and 4×600’s. I also did hill sprints on my recovery days somehow thinking those short bursts would be just the thing to carry me 3.1 miles. I can see that this race report could take longer than the race if I continue like this so I’ll try to move this along. 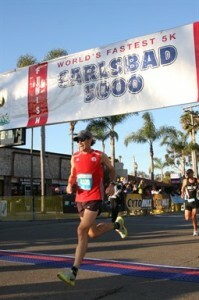 The Carlsbad 5000 has about 5 separate races, Master Men, Master Woman, 30-39, under 30, elite invitational, etc. being held at different times throughout the morning. For the Masters Men race there were about 1500 entrants which was slated to be the first start at 7:00 am. I pre-ran the course to warm-up at 6:30 and got a good feel for the layout and slight grades. The starting area had self-policing corrals with your projected pace signs. This seemed to work pretty well and I found it easy to get up to the front line with the ‘5 minute’ pace group.At the gun we were off and after a couple hundred yards tried to settle into a good pace. Not too fast, not too slow but just around 5:15 pace was the plan. Things started to spread out pretty nicely and I passed the one mile mark with about 5:10 on the clock and feeling good. The majority of the course is an out and back along the main road the parallels the ocean. With two 180 degree turns at each end there were plenty of opportunities to check on your placing and the competition. At the first 180 I passed a couple runners right at the turn and was on my own for a spell. I noticed a group of 6 or 8 runners up ahead about 50 feet and slowly tried to reel them in. It took about 3 minutes to catch them and I stayed behind them for another minute. This part of the course was a bit slower due to some wind and slight up grade. I did cough intermittently for the rest of the day. I guess my carbon deposits got loosen up good.